We all think of vitamin D to build strong bones, but it has many other functions in the body as well. 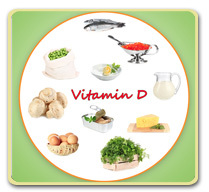 Vitamin D is a fat-soluble vitamin, which is naturally present in only a few foods. The good news is that your body can make it. All you need is sunlight. That is why vitamin D is called the sunshine vitamin. Vitamin D promotes calcium absorption in the gut and maintains adequate blood levels of calcium and phosphate which enable normal bone development and maintenance of bone density. Without enough vitamin D, bones can become, thin and brittle, or deformed. It prevents rickets in children, and osteomalacia (softening of the bones) in adults. Together with calcium, it helps protect against osteoporosis (weakening of the bones) in older adults. Vitamin D is also vital in many body processes, including cell growth, neuromuscular function, immune function, and reduction of inflammation in the body. When ultraviolet rays from sunlight strike your skin, this triggers vitamin D synthesis. This vitamin D is biologically inactive, so it must then undergo two different chemical changes in your body to become activated. The first chemical change happens in the liver, and the second occurs primarily in the kidneys. The final, physiologically active form of vitamin D is known as calcitriol. Sunlight, as I mentioned above is a great source of vitamin D. Since we have started using more sunscreen, and people have been spending more time indoors, vitamin D deficiency has become increasingly prevalent in recent years. It is still a good idea to limit exposure of the skin to sunlight, due to the risk of skin cancer. Some studies indicate that between 5 and 30 minutes of sun exposure to your arms, legs, or face, twice a week between 10 am and 3 pm usually leads to sufficient vitamin D synthesis. You don’t need to be a sunbather to get your vitamin D.
Besides sunlight, there are a few foods which contain this vitamin. The best natural sources are fish liver oils and the flesh of fatty fish, like salmon, tuna, and mackerel. Small amounts of vitamin D are found in beef liver, cheese, and egg yolks. Some mushrooms contain vitamin D. In the US, most of the vitamin D in our diet comes from fortified foods. Milk is voluntarily fortified with vitamin D, which was started in the 1930s to combat rickets in children. Other dairy products made from milk are not usually fortified. Breakfast cereals are often fortified with vitamin D, as well as some orange juice brands, yogurt, and some other food products. Breastfed infants – The American Academy of Pediatrics recommends that exclusively and partially breastfed infants be supplemented with 400 IU of vitamin D per day. Older adults – As we age, our skin is not as good as making vitamin D. We are also more likely to spend less time outdoors, which gives us less sunlight. People with very limited sun exposure – Based on occupation, religious clothing, etc. People with darker skin – More melanin in the skin reduces vitamin D production. How do you get enough vitamin D? Most of us get enough sun exposure if we are spending a little time outdoors every day. Otherwise, the most recent nutritional guidelines recommend that Americans should meet their nutritional needs through a variety of natural food sources, rather than supplements. Certainly if you have a vitamin D deficiency, you may need supplements for a period of time, but in general, we should try to eat a varied diet, full of fruits and vegetables of various colors and textures, whole grains, milk and milk products, fish, lean meats and poultry, eggs, beans/peas, as well as nuts and seeds. Excessive intake of vitamin D can lead to toxicity. Vitamin D toxicity can cause a variety of health problems, and can even increase your risk for certain types of cancer. Vitamin D supplements can also interact with many medications. I would not recommend taking Vitamin D supplements, other than the amount found in a good multivitamin, without first talking with your doctor.